Earlier this week we began moving some of our oysters hanging in milk crates to fresh crates as the existing ones had become a bit encrusted after two years in the harbor. It was refreshing to see a thin line of fingernail like growth along the edge of shells. They are waking up and getting active again. It also was nice to see that the larger oysters had almost no mortality. (If only we could get the same survival on the bottom.) The sealife living among these oysters was amazing; including eels, a 7 inch perch, crabs, and shrimp. The Massachusetts Oyster Hat is popping up everywhere. House Speaker Robert Deleo was spotted sporting one outside Boston's old City Hall on School Street. 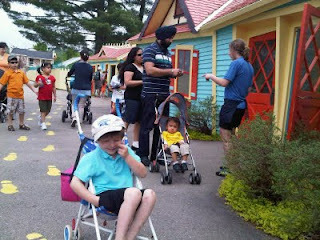 This little fellow was spotted in Storyland NH. Since we have had challenges obtaining regulatory approval to bring oysters to other areas of the Harbor we have forwarded a petition to the Governor with over 200 signatures requesting that he explore the matter. We also are seeking to build a broader coalition of support for oyster restoration to help move the bureaucracy forward. Thus we met with Speaker DeLeo. There will be a meeting on June 15th sponsored by The Boston Harbor Association to discuss the future of the Harbor and where we take it from here. If you are interested in getting involved by attending, please visit this registration site. Finally, while checking in on our blog activity we learned that a website Cities and Squares had sent us a fair amount of traffic as they had referenced work our interns had done in tracking down the historic presence of oysters in Cambridge. While visiting their interesting real estate based site, we learned that Rialto offers $1 oysters every Monday night at 5:30. We had to share the good news!